Medical billing clearinghouses are like a middleman for claims. They scour each claim you send them for errors or potential denial triggers, tell you about the bad claims, and send the good ones off to be reviewed by insurance. When a patient is seen in a doctor's office or hospital, or goes to the pharmacy to get some medicine or the lab for some blood work, a claim is generated. This claim is sent to the patient's insurance company. They review the claim codes and charges, check the patient's benefits and eligibility, then either pay or deny the claim. Imagine how many times this happens throughout the nation every day. There are over three to four million licensed healthcare professionals, who send insurance claims to over three thousand insurance companies on a daily basis. The patient identification number was incorrect, or a diagnosis code is invalid, or another important piece of patient demographics is missing. This would be a complete disaster! Claims processing and payment would slow to a standstill. Twenty years ago, this was a real concern for all healthcare professionals and insurance companies. All claims were sent on paper. The insurance company would scan and interpret each and every piece of paper, and enter the claim into their electronic system. In smaller insurance companies paper claims were received in the mail. Claim handlers would manually enter all codes, charges, and patient and provider data. But these days claims are sent out electronically to the insurance companies. Instead of sending each claim individually to each insurance carrier, many medical billing and coding software packages now use a medical billing clearinghouse, which holds claims until they are ready to go the insurance. Medical billing clearinghouses are like a huge electronic file folders, where you send all of your patient claims. They contain many checks and filters, which go through each claim and make sure there's nothing wrong with them. This is like having a medical coder or biller check each and every one of your claims, before they are sent, to make sure they won't be returned or denied for any reason. This is called scrubbing. Your billing clearinghouse scrubs all claims before they send them to the insurance company. If any of the codes are wrong, or if any important data is missing, the clearinghouse won't send the claim. You'll have to go in and correct the claim, after which the clearinghouse will send it. Depending on your clearinghouse and the insurance company to which you are sending claims, the clearinghouse may also receive important eligibility information from the insurance carrier. This may return claims to you due to lack of patient coverage. No matter the reason, this saves time and energy on the part of the medical biller. Instead of waiting for the claim to go through the postal service, and then for the insurance company to process the claim, who then sends a denial or request for further information, all you have to do is fix the claim and resend it. You can often fix a claim, resend it electronically, and get it paid before it would have even gone through the long process of paper claims handling. In most cases, electronic claims are paid in as little as two weeks. Once the medical billing clearinghouse has scrubbed all of your claims, it will send them out in batches to each insurance company. You also have the option of logging in remotely to check whether or not your claims have been sent, and how many were rejected or denied. Depending on your clearinghouse, you may also be able to correct claims and send them through your clearinghouse without even changing them in your own billing system! 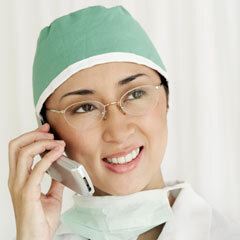 You may be thinking "medical billing clearinghouses sound wonderful, where do I sign up!?" First of all, you need a fast and reliable internet connection. If your internet goes down and you can't get it back up, or if your computer system crashes, your revenue cycle will stop. If your claims can't get out electronically, you will have to print out and mail every claim through the regular mail. Because of this, make sure you always have a backup insurance printer, which is well stocked with the appropriate claim forms. Secondly, be warned of hidden costs. Claims clearinghouses are not free. You have to pay a certain price per claim, so be prepared to pay out a little extra for the convenience. There also may be hidden costs involved with your clearinghouse processing. You have to buy constant software upgrades and you may even have to upgrade your hardware in order to stay in compliance with clearinghouse needs. And lastly, be prepared to have one more login and password, and more administrative time spent on the phone, checking on claims processing. So, what's the right choice? All in all, medical billing clearinghouses are a huge benefit. Whatever the costs are to the medical practice, either through individual per claim cost or in software upgrades, the benefits are greater. The time saved by printing and folding, as well as the postage saved mailing the claims, is more than the cost of sending the claims electronically. Furthermore, you're able to check if there are major problems with your claims batches instantaneously. You can then immediately correct and send claims as necessary, averting any claims disasters in the making. Whatever expenses you incur when you purchase a medical clearinghouse package are well worth the investment. Just make sure you are prepared by having a back up plan if your internet goes out, and be prepared for any unexpected and costly software upgrades.